The perfect five days in Montreal, as curated by my tribe. So, you’re off to Montreal and want the low-down on what to do? Somewhat surprisingly, it’s not as easy to get a list of great experiences as it is for other world-class cities: no obvious Wallpaper guide or Timeout or Perfect Four Days in Buenos Aires equivalents. Perhaps they’re all in French? Musee des Beaux-Arts: Museum of fine arts. ‘Nuff said. Cinema Robotheque: On-demand movies, evening screenings of documentaries, and more. We didn’t make it here, but really wanted to go catch the The Boxing Girls of Kabul here. Espace Tangente, “Laboratory for contemporary movements”: modern dance. La SAT, Societe des Arts Technologiques in Montreal: multimedia arts space with a restaurant and a rooftop. La Tulipe: for cabaret and sometimes bands. Casa del Popolo: live music, readings, and various other events. We held the Beautiful Trouble Montreal book launch party here. Great folks. Parc du Mont-Royal, obviously. Laze in the sun, picnic, run, or play drums. “Walks on St-Catherine for live bands playing in the street in front of la Place-Des-Arts at all times,” says Jolyane. 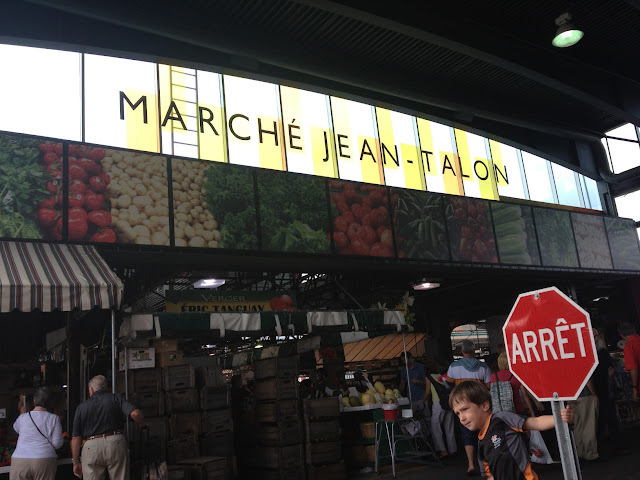 Jean Talon market on Saturdays. “Parc Lafontaine is always great for a few hours on a weekend afternoon and sometimes live shows in the evening,” says Michael. Parc Laurier for ping-pong and Anarchist soccer. “The Lachine Canal if you feel like a nice ride complete with a pitstop at the McAuslan Brewery patio,” says Michael. The Old Port of Montreal: “So cute and charming… I really recommend going there (get of at either Place Des-Armes metro or Champ-des-Mars metro on the Orange Line) walk around and be a good tourist,” says Elinor. And, when your feet are exhausted from walking, “Scandinave Les Bains for a sweet daytime massage, hot pool, cold pool, etc,” says James. Kaza Maza: Surprisingly good middle-eastern fare. On par with Rumi, minus the ambiance. Suggestions from Darren: Kazu, Grumman 78, Cuisine Szechuan, Qing Hua. Comptoir 21: for fish & chips. Brebiou (tangy sheep’s milk cheese) from Fromagerie Hamel, says Jon. Boulangerie Mamie Clafoutis on St Denis, says Micheal. “Aux Vivres for a vegan pick me up,” says Mary. We had brunch at Le Vieux Velo on Sunday. Great service, amazing coffee, and superb food (if you like eggs). “And if you run into a yellow truck called La Mangeoire: best food street,” says Liza. Montreal bagels: “FYI, I did the taste test – grabbing some bagels from St-Viateur and some from Fairmount (about 2 blocks away) and partaking. If either one was the winner, I dunno … I felt I came out the winner, all things considered,” says Jon. Poutine: Jessica recommends you check the Poutine Pundit’s latest listings to find the best spot. When you’re out of ideas and it’s 2AM, best to get some tasty French fare at L’express. “Garde-Manger for good eats,” say most of my peeps. I was there during Matt & Katie’s wedding weekend and it did not disappoint. Le Club Chasse Et Peche Restaurant, which I also tried with Matt & Katie, was mind-blowing, but austere. Jessica recommended the new restaurant they own, Le Filet. Lawrence: Popped in for lunch and lucked out with lobster poutine and lobster rolls. “Rumi, followed by dessert at la figaro across the street (get the rum croissant),” says Mary. Checked out Rumi on Saturday night late and got a seat in five minutes. Service was “meh,” but the food was excellent. Didn’t have room for the rum croissant, but picked one up anyway. Jessica took us to Buvette Chez Simone where we rubbed shoulders with the hipsters and ate charcuterie and rotisserie chicken. Tasty! Beers: Friends suggested Vices et Versa, Dieu du Ciel, and “Le Sainte Elisabeth for the prettiest patio.” I stumbled on Alexandraplatz and was impressed with the modern German beer garden feel, hip crowd, good music, and fine selection of local beers and wines, as well as some people making BBQ in the corner. “Bouillon Bilk on St-Laurent for a most delicious dinner,” says Liza. Didn’t try it, but passed by and the menu looked tempting. “Oh and rooftop patio at La SAT, drinks, beautiful quebecois people and sun and buildings,” say Jolyane. A huge thanks to Brad, David, Darren, Jessica, Trevor, Rodrigo, Jon, Brian, Mary, Michael, Jolyane, and James for these suggestions! Have additions, drop them in the comments or Tweet at me. Sublet my *amazing* office/studio: available from September until next spring.